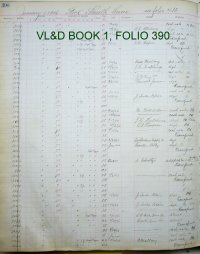 The Von Lengerke & Detmold Record Books begin in 1901 and cover the period through 1929. The are 3 volumes: Book 1 covers 1901 to 1909, Book 2 covers 1910 to 1922, and Book 3 covers 1923 to 1929. Most pages are limited to one make and model and each list for a given year begins on February 1st, probably following a January inventory of the firearms. The books include both new and used firearms. Used guns owned by Von Lengerke & Detmold are called "Second Hand Guns" while consigned guns are called "Guns Left for Sale". Although there are exceptions to each of the following, generally the firearms in Book 1 describe only the gauge, barrel length, weight and D@H. The name of the purchaser is recorded if other than a cash sale. The firearms in Book 2 list the dates of acquisition and sale, most gun specifications and the purchasers but not the cost or price. The firearms in Book 3 list all of the above plus the price at which the gun was sold, in code. 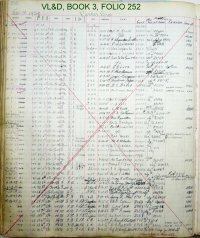 Book 4 is a stock list of for 1913-1914 and includes many non-gun items. The guns in Book 4 show only make, model and serial number. It is uncertain if this is a Von Lengerke & Detmold or an Abercrombie & Fitch record. Beginning in 1929 the record books are labeled Abercrombie & Fitch and there are 16 volumes up through 1965, Book 5 through 20.Most of the Abercrombie & Fitch volumes cover a period of 2 or 3 years each. From this point the records show all of the above information in the Von Lengerke & Detmold books plus the cost to Abercrombie & Fitch and the retail price of the firearm. These costs and prices are shown in code until Book 18 in 1962 when they began to be recorded in dollars. A line drawn through a serial number simply means that the gun had been sold. Unsold guns were transferred to the next year’s inventory pages as of February 1st. Those transferred are usually indicated by a red check mark. 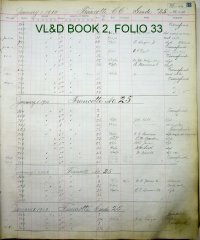 A large ‘X’ drawn across a page indicates that the inventory page had been completed. Serial numbers are almost never written in sequential order, rather they are by date of acquisition. The name of the purchaser is often shown with an initial instead of the first name. The clients of Abercrombie & Fitch include some recognizable names and occasionally one will see entries for: E. Hemingway, WR Hearst, K. Roosevelt, (Kermit, son of TR), or JP Sousa, Jr (son of the conductor) among many others of note. Stock dimensions, when listed, are in the order: Drop @ Heel, Drop @ Comb, LOP. Grip styles are listed as: “Str” (straight grip), “½ grip” (semi-pistol grip) or “FPG” (full pistol grip). Frequently new guns were returned by the buyer and resold. These are re-entered in the new gun listings with the name of the former owner written above the date of acquisition.